The advice follows an independent review on the effect of screen use in children and young people. Screen use: Doctors urge parents to restrict time spent on phones. Families should ban phones at bedtime and keep them away from the dinner table, according to the UK's top doctors. The guidance has been published by four chief medical officers, including Scotland's Dr Catherine Calderwood. She said youngsters are waking up to read messages and interrupted sleep is impacting on their health and schoolwork. Dr Calderwood has joined her UK counterparts in publishing official guidance on social media and screen use. The advice forms part of a "precautionary approach" following an independent review on the effect of screen and social media use in children and young people. It also recommends phones be kept away from the dinner table to encourage interaction between parents and children. She told BBC Radio Scotland's Good Morning Scotland programme: "Because we know that children are waking up deliberately to check their messages, or their messages wake them up, that's why we've said to put phones outside the bedroom. "The effect of interrupted sleep is really is quite significant on children's health and well-being, and on their concentration at school. "We would want people to be sensible and think about whether their children are getting enough sleep." Dr Calderwood said research had shown an association between increased screen time and children's anxiety and depression levels. She said: "There's no evidence of causation of harm, but what we have seen is a rise in children's depression rates, a rise in children saying their quality of life is lower if they are using screens for long periods of time. "We do know that one in five children wakes up at night to check their phones for social media messages, and interrupted sleep decreases their quality of education the next day. "There isn't a cause and effect, there seems to be an association, and that's why we've been very cautious in making very bold statements about the harms. "What we've done is set out some tips for parents, and this comes because they are asking us for them, as are children and young people." The chief medical officers, including Professor Dame Sally Davies for England, Dr Frank Atherton for Wales and Dr Michael McBride for Northern Ireland, said there is insufficient evidence to recommend an optimal amount to spend online, but suggest parents set boundaries to ensure a healthy balance. Professor Dame Sally Davies, chief medical officer for England, said: "Time spent online can be of great benefit to children and young people, providing opportunities for learning and skills development, as well as allowing young people to find support and information. 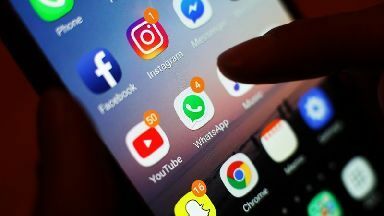 Measures to protect children online could include introducing clearer terms of conditions, improving age verification, and sharing anonymised data for scientific research to help improve understanding of the effect of screen time on young people, they said. "It is imperative that the technology industry proactively acts in the interests of users, as well as shareholders," a report by the medical officers states. Some research included in the review, which was carried out by a team at University College London, has found a link between those who use screen-based activities more frequently and over longer periods and mental health problems. But it is not possible to determine if screen time can cause these issues. Parents are also being encouraged to talk about sharing photos and information sensibly online with their children and lead by example when it comes to screen use. Shirley Cramer, chief executive of the Royal Society of Public Health, said: "Barely a day passes without yet more concerning findings regarding the potential harms around screen use or social media. "This advice is therefore a step in the right direction towards the establishment of much needed clearer guidance which parents are crying out for to protect their children and help them navigate the Wild West of the digital world."